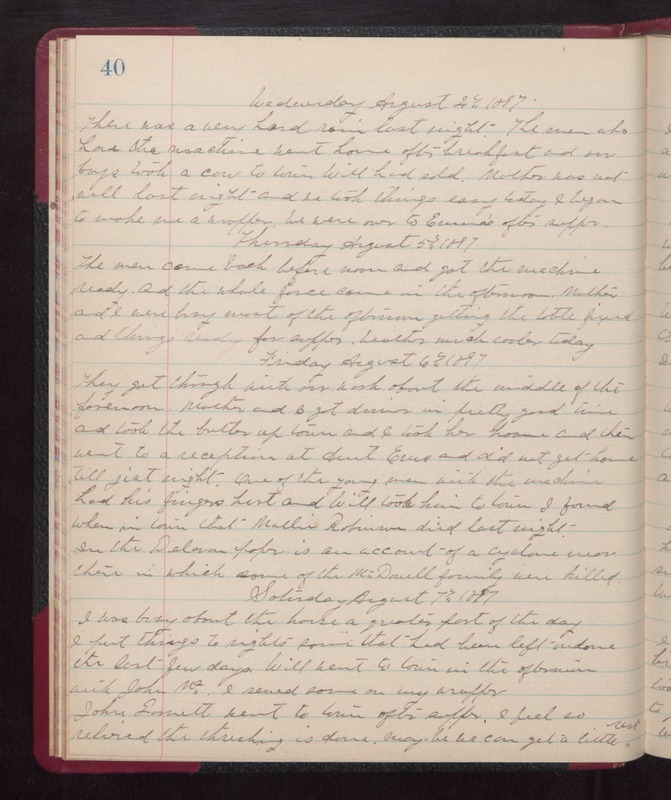 Wednesday August 3rd 1897 There was a very hard rain last night. The men who have the machine went home after breakfast and our boys took a cow to town Will had sold. Mother was not well last night and we took things easy today. I began to work me a wrapper. We were over to Emma's after supper. Thursday August 5th 1897 The men came back before noon and got the machine ready. and the whole force came in the afternoon. Mother and I were busy most of the afternoon getting the table fixed and things ready for supper. weather much cooler today. Friday August 6th 1897 They got through with the work about the middle of the forenoon. Mother and I got dinner in pretty good time and took the butter up town and I took her home and then went to a reception at Aunt Emms and did not get home till just night. One of the young men with the machine had his fingers hurt and Will took him to town. I found when in town that Mollie Robinson died last night. In the Delavan newspaper is an account of a cyclone near there in which some of the McDowell family were killed. Saturday August 7th 1897 I was busy about the house a quarter part of the day. I put things to rights some that had been left undone the last few days. Will went to town in the afternoon with John Mc-- I sewed some on my wrapper John Garrett went to town after supper. I fell so relieved the threshing is done. Maybe we can get a little rest.